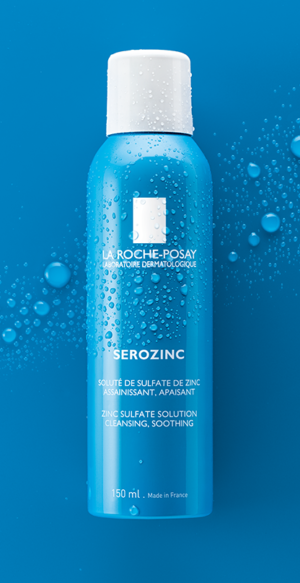 La Roche-Posay Serozinc is a facial mist spray that is used after cleansing as a mattifying skin toner to reduce the oily shine in acne-prone skins and it is also suitable for sensitive skins. It also helps to reduce redness and inflammation associated with rosacea-prone skin and it helps to sooth skin when sunburnt or after a skin rejuvenation treatment. Key ingredients include Zinc Sulphate which reduces the secretion of sebum, limits inflammation and helps to heal the skin. Applying a zinc-enriched product topically, for example in a mist, is a simple way to inhibit the 5α- reductase enzymes that increase sebum production and lead to problematic skin. Thermal spring water containing selenium, provides a soothing effect and acts as an antioxidant participating in the destruction of free radicals to protect and purify skin. 100% hypoallergenic. Tested under dermatological and ophthalmological control. Fragrance-Free. Paraben-free. Oil-free. Dr Webster’s Recommendation: This clear, water-like mist spray offers multiple solutions for oily, acne skins and skins with any kind of inflammation. It helps to purify, calm, soothe and mattify and it has been demonstrated to clinically reduce sebum production. It is the perfect product for your hand or travel bag and can be used when skin is over-heated and flushing occurs. Non-perfumed. Spray then leave to penetrate 2-3 minutes. I have oily skin that shines early in the day. I have tried various moisturisers, base and primers. This is the first product that I have used that helps me achieve a more natural (non-shiny) appearance. I spray it on before I apply make-up and thereafter. Sometimes I spray during the day as well. A great, affordable product. I received this as a free gift with my order and oh happiness! I spray this before applying my La Roche-Posay BB cream and the effect is picture perfect! Thank you!